Likes: Margaret Cho, "All-American Girl"
Before receiving these DVDs, I didn't remember a whole lot about this series, except that I know I watched the show and that I thought I enjoyed it. 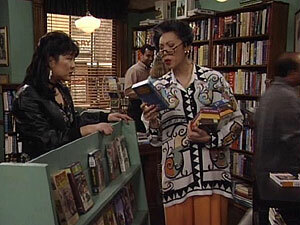 Supposedly based on the stand-up act of Margaret Cho, the series follows the life of college student Margaret Kim, and her multi-generational Korean family. Three generations living under the same roof creates plenty of culture clashes in the first prime-time American series to focus on an Asian-American family. Cho plays her part to the Valley Girl hilt, as she frustrates her traditional Korean family and their friends with her very American personality. The show tries to meld that cultural conflict with Margaret's work life at the shopping mall, her unsuccessful personal life and her American friends, including comic Judy Gold. The end result didn't truly jive with Cho's stage persona, turning off her fans, and is pretty uneven in terms of the shows' themes. Even so, it has quite a few laughs. The best part of the series, on a consistent basis, is Grandma, played wonderfully by Amy Hill (The Cat in the Hat). As the eldest member of the Kim family, she represents the traditional Korean culture, while at the same time being a complete television addict, gleefully spending her days watching anything and everything. Just about every scene she's in gets a laugh, whether through Grandma's sweet naivety or hilarious bombast. The rest of the family is good, especially Clyde Kusatsu, who fills the part of a TV dad well, and Jodi Long, who's cute as Margaret's mom. Stuck in the middle is the very talented B.D. Wong (M. Butterfly), who doesn't get much to do as the Kims' perfect doctor son, outside of a few episodes that focus on him. On the downside, the youngest son Eric is a bit unnecessary, and also facilitates the presence of his little friend Casey (Ashley Johnson, What Women Want), who might have been one of the most annoying child actors ever. The final few episodes of the show are a textbook example of desperate television, as they try everything to save a doomed series. After bringing in Oprah Winfrey to guest on one episode to draw in female viewers (along with a small, but amusing part for Jack Black), Cho's pal Quentin Tarantino stopped by for an episode-long Pulp Fiction parody, creating possibly the best episode of the series. Taratino's Christopher Walken imitation is priceless. Then, in the final episode, the entire concept of the series was thrown out the window, as Margaret was suddenly living with three male roommates (including Diedrich Bader of "The Drew Carey Show") and Grandma became the Kramer to Margaret's Jerry Seinfeld. Even the theme song was gone. Without her family, "All-American Girl" became just another series about young, hip friends, and it died a quick death, though not before featuring small cameos by Vicki Lawrence, Maritska Hargitay and David Cross. 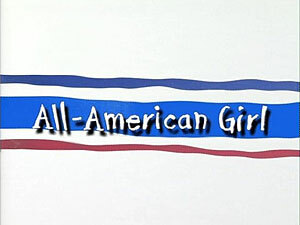 The 19 episodes of "All-American Girl" are spread over four DVDs, with four on the first disc and five on the remaining three. The discs have animated full-frame main menus, which list the episodes, commentaries (see The Extras) and a play-all option. There are no audio options and no subtitles, though the episodes do have closed captioning. These episodes are presented in full-frame, with a level image quality that befits a mid-'90s network sitcom. Colors are good, but not overly bright, while the level of detail is solid. Video grain and some edge enhancement can be seen in places, but the discs look good overall. The Dolby Digital 2.0 soundtrack is standard TV comedy quality, with clear dialogue and sound effects, though the laugh track can be a bit heavy in the mix. There's nothing exceptional about the audio, and no one should expect any more. Episode-length audio commentaries are provided on four episodes, one per DVD. Cho chats by herself on "Mom, Dad, This is Kyle" and "Pulp Sitcom", and is joined by Hill on "Take My Family Please" and "The Apartment." Cho has plenty to say about the show, including her relationship with some of the cast, the issues that went on during production and why the show failed. But oddly, she seems to forget what she's said on the other tracks, repeating herself and messing up at times, like when she says an actor's name on one show, and then can't remember it on another. Informative, these commentaries should appeal to her fans. Cho and Hill get together again for a 20-minute on-screen conversation, punctuated by clips from the show. Some of the ground covered is repeated from the commentaries, but if you have any interest in how the show was put together and what went wrong, this featurette should provide the answers. The two friends are very relaxed and chatty, making for a decent bonus. Aside from the subject matter, there's nothing ground-breaking about this series, but it certainly deserved a better fate than a one-season run. A traditional sitcom, it featured some quality laughs and a breakout character in Grandma, making a viewing less than painful. The bonus features aren't exactly enjoyable, as most of them focus on the show's demise, but if you like the show, it's a little something extra. Cho fans should check out this series, as should people looking for some good laughs.